Wayne calls it a two-hour knifemaking adventure. 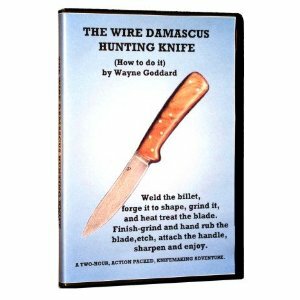 This DVD shows every step in making a knife and after the billet is welded up. Circa 90% of the instruction applies to a knife made of any type of steel. CONTENTS anvils, hammers, hammer practice, more hammers, distal taper explained, start forge welding sequence, forge-welding "heat" defined, forge welding the cable, twisting the partial welded cable, guillotine and spring fuller tools explained, Second welding heat, billet doubling, third welding heat, billet shown, 4th weld, 5th weld, removing scale, wet hammering, cut off hardy, scraper for scale, slow action weld, blade shaping with the hammer, hot rasp, spring fuller in use, shaping the narrow tang w/ the guillotine fuller, coal versus gas, the blade preform, preform curve, drawing out the edge bevel, shaping hammer, spreading, Packing, normalizing, annealing, talk about the color on the video not being accurate, wedge tool, beater, schwocking (adjusting the curvature of the blade), vermiculite, baby furnace, Heat treating, grind prior to heat treat, decarburization, the goop quench, Heat treating sequence: Heating for quench, temper colors, safety with quench oil, quenching the blade, cleaning off the quench oil, checking the hardness, Alternate tempering methods: Edge quenching, the soft back draw, the tempering oven, the brass rod edge strength test, home-made belt grinders, grinding, inspecting the rough grind, modified vise, hand rubbing the blade, home made flat-disc machine, Bowie knife with 15" blade, Etching, cold bluing, handle fitting, drilling pin holes, inletting the tang, gluing up the handle, pinning, shaping, and finishing the handle, sharpening.